The luggage compartment can be increased in size by folding the seat backrests forward. The seat backrests can be folded forward individually on vehicles with divided rear seats. Before folding the rear seats forwards, adapt the position of the front seats in such a way that they are not damaged by the folded rear seats. 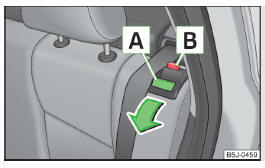 Unlock the seat backrest by pressing the securing knob A » Fig. 57 and fold it forwards. Pull the head restraint out of the seat backrest. Fold the seat backrest completely forwards. Push the head restraint into the slightly lifted seat backrest. Make sure that the red pin B is hidden. The belts and the belt locks must be in their original position after folding back the seat backrests - they must be ready to use. The seat backrests must be securely latched in position so that no objects from the luggage compartment can slip into the passenger compartment under sudden braking – there is a risk of injury. Ensure that the rear seat backrests are properly engaged. It is only then that the three-point seat belt for the middle seat can reliably fulfil its function. Ensure that the seat belts are not damaged when operating the seat backrests. Under no circumstances must the rear seat belts be jammed by the folded back seat backrests. On vehicles with an installed net partition housing, first fold back the left seat rest followed by the right one. The luggage compartment can be increased in size by folding the seat backrests forward or by removing the rear seats. Pull up the seat squab in the direction of the arrow 1 » Fig. 58 and fold forwards in the direction of the arrow 2 . Fold the seat cushion forward. Press the wire loops in the direction of the arrow » Fig. 58 - B and remove the seat squab from its bracket. Press the wire loop in the direction of the arrow » Fig. 58 - B and fit it into the bracket. Fold the seat cushion back into its original position.